JT is going to be a dad ❤. Same giorno of his birthday.....Justin postato this foto on his instagram, of him baciare his wife Jessica biel pregnant belly. 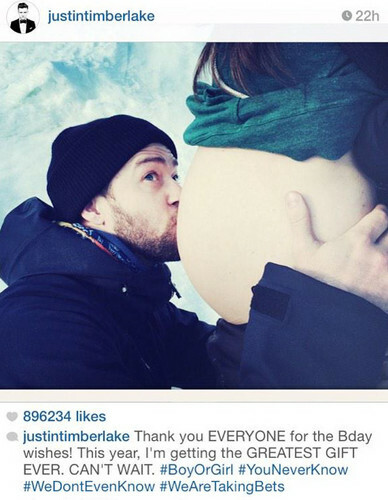 congrats JT & Jessica.. HD Wallpaper and background images in the Justin Timberlake club tagged: photo jt justin timberlake jessica biel cute timberbiel timberbiel baby instagram. Same giorno of his birthday.....Justin postato this foto on his instagram, of him baciare his wife Jessica biel pregnant belly. congrats JT & Jessica. This Justin Timberlake photo might contain giornale, carta, riviste, tabloid, straccio, rivista, diagramma di venn, anime, fumetti, manga, and cartoni animati.